Of all her recipes, the one I prepare the most is her superb take on roasted chicken. It is from The Paris Cookbook. 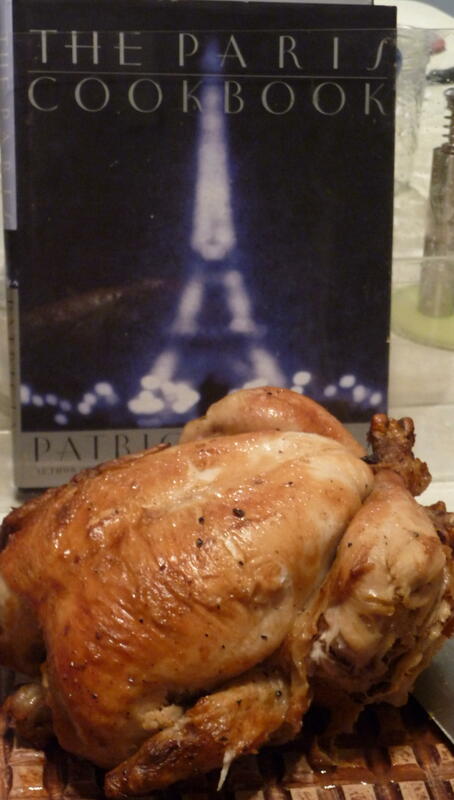 The roasted bird is so memorable that this is the Eiffel Tower of chicken recipes. OK, this metaphor is as over the top as the lights shining brightly on the apex of the tower at night (the illustration on the cookbook’s cover, after all, is Gustave’s most famous erection). This preparation of chicken is truly iconic and towers above all others, so my metaphor is not completely ridiculous…. The story Ms. Wells described is the lemon in the interior, which she and her husband “accidentally” discovered and found comparable to a “confit” after roasting. Rather than just tossing the lemons from the cavity, they found that the roasted and, hence, concentrated lemon juice was delicious squeezed on the white and dark meat upon serving. 1. The chicken has four 90-degree turns, to ensure even roasting, juiciness throughout, and a beautiful golden skin. 2. The lemons in the cavity ensure both a subtle citrus flavour in the chicken, as well as a marvelous sassy counterpoint to the richness of the chicken, when squeezed over the carved poultry. Having done many versions of roast chicken in my day, I find this is the best. I rarely contemplate even trying another recipe for a whole chicken. It is one which I have given to friends on the island – even those who are completely culinarily-challenged – and they have had great success with it. I have not included the gravy recipe, as I only used it the first time – although it was very good and rich, gravy is totally unnecessary with the lemon. My major adaptation is to include a bed of new potatoes under the chicken, to prop it up at 90, 180, 270, and 360 angles during the rotation, and to luxuriate in the butter, olive oil (another addition of mine, to get the potatoes going immediately), and chicken fat. 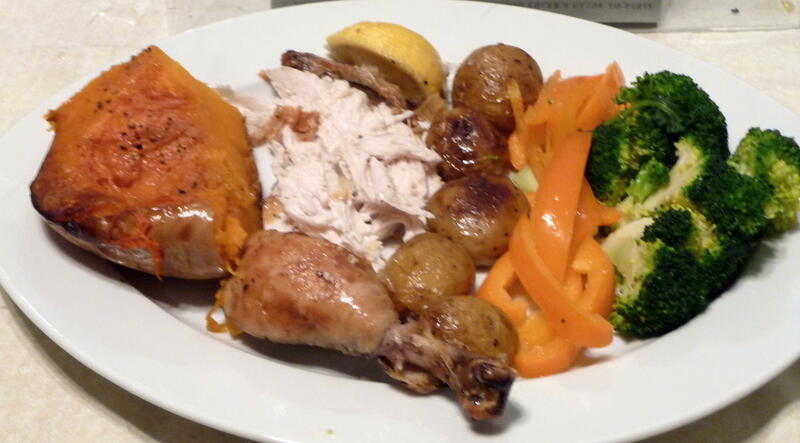 Roast potatoes are a delicious bonus and complement to the chicken. It makes a perfect Sunday night dinner or even a meal for entertaining close friends. For me, even if I never ate this recipe in Paris, its lemony essence reminds me of tartes au citron, macarons au citron, and many other tart and sweet memories of ma vie parisienne. Roasted butternut squash, Julienne orange peppers, and broccoli round out the dinner. Adapted from The Paris Cookbook by Patricia Wells. 1. Preheat the oven to 425º. Generously season the cavity of the chicken with salt and pepper. Add the quartered lemon and the thyme sprigs to the cavity. Season the outside of the chicken all over with salt and pepper. Melt butter. 2. 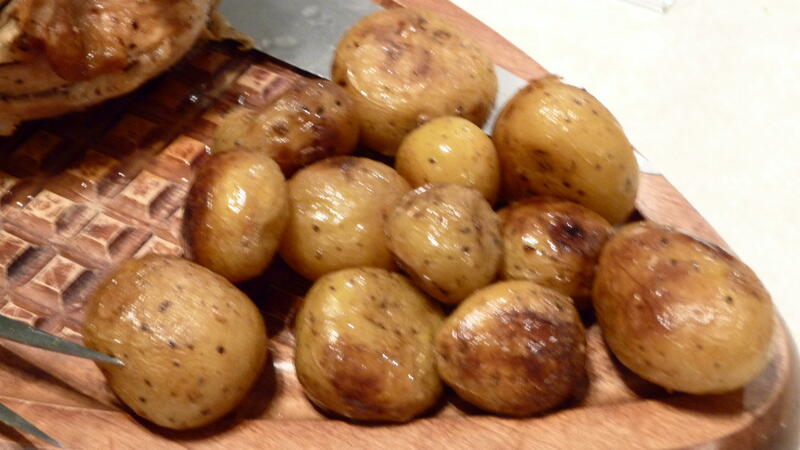 In a large roasting pan, arrange the potatoes in a single layer and season with salt and pepper. Set the chicken on the potatoes on one side. Brush with melted butter. 3. Roast for 20 minutes. 5. Turn chicken right side up, baste, and roast for yet another 20 minutes. 6. Turn heat down to 375º. 7. Place the chicken upside down, baste, with breast end elevated to retain more moisture. 8. Roast the chicken for another 15 minutes, or until the chicken juices run clear from the cavity and the potatoes are tender. 9. Transfer the chicken to a carving board, cover loosely with foil and let rest for 10 minutes. Arrange the chicken and potatoes on a platter. Remove the lemon quarters from the cavity and squeeze the juice all over the chicken. 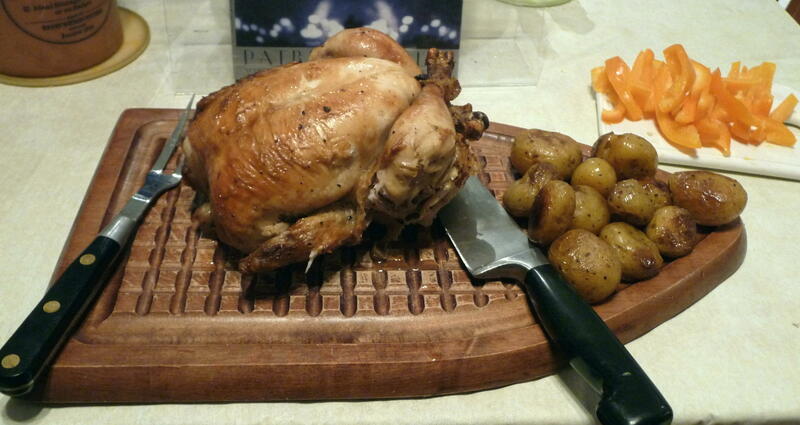 This entry was posted in Main courses and tagged Chicken, Dinner, French, Paris, Pastries, Potatoes, Recipe. Bookmark the permalink. Ce poulet semble tellement bon. J’aimerais bien ce livre. Merci bien, Hélène. J’apprecie tes commentaires.